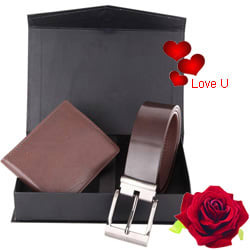 Please the gentleman you esteem by gifting him this Attractive Combo of Wallet and Belt. Crafted out of standard Brown Leather and arranged in a deft Black Box, the Wallet and the Belt are sure to please hearts. Flowers Delivery Sangli, Send sweets Sahranpur, Wedding Cake Anand, Diwali Mithai Ratnagiri, Send Flowers and Gifts to Saharanpur, Online Shop Shillong, Flower to Haridwar, New Year Flowers Bhusawal , Fresh Fruits Namakkal, Send Gift Shimla, Dry Fruits to Hoshiarpur, Birthday Delivery Belgaum, Sending to Navsari, Flower shop Calicut, Devangere Online Cake Delivery.